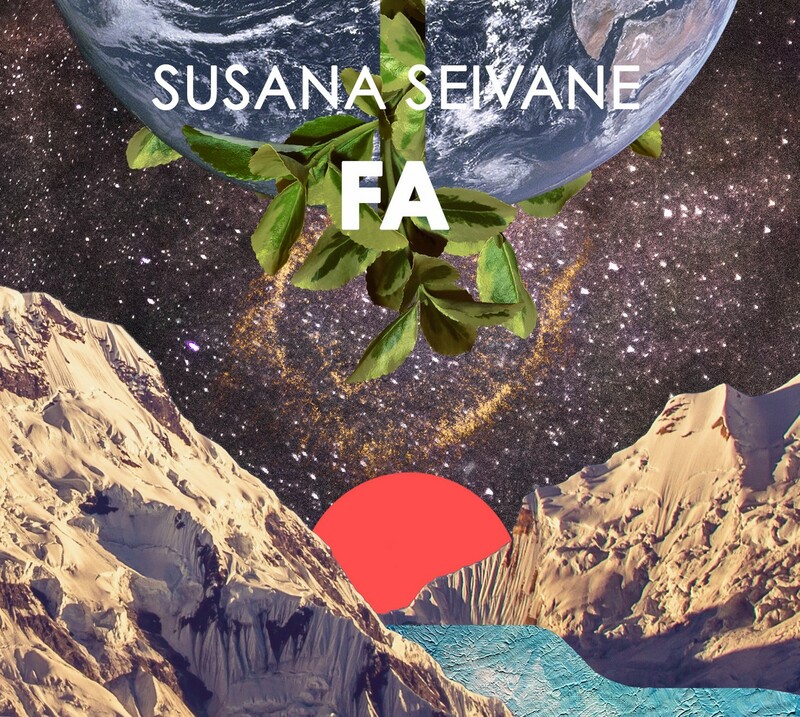 VOTE "BEST ALBUM OF WORLD & FUSION MUSIC"
Susana Seivane presents her new album, FA. FA is the new work of Susana Seivane after eight years of silence, a long period that served as inspiration for her to compose her fifth album. FA (Fiz and Antón) is a deep introspection in the field of maternity, conventions, family and personal fulfillment. Without losing her defining essence, Susana explores new rhythms by imprinting modernity in tradition and becoming one of the most virtuous bagpipers of all time. With universal themes such as superlative love, fear, insecurity or absolute happiness, Seivane builds a sound landscape without showing its roots, giving it new nuances as a result of her maturity as a composer and instrumentalist. FA will be released next September 14TH, in its physical edition and in the usual digital platforms. Susana Seivane in "Noites no Castelo"
Combarro will host a few days around the traditional boats and many more activities. The concerts will be at night, at the Peirao da Canteira, from 23pm, Susana Seivane will play on Saturday. On Friday, June 23, at Parque de Andalucía, we will celebrate the Night of San Juan and the Celtic Night, with the performance of Susana Seivane after the fires. INTERXERACIONAL is a journey through the recent history of Galician music that joins several generations around the gaita of Susana Seivane. An INTERGENERATIONAL journey that begins in 1939 when the grandfather of Susana built his first gaita and founded this family of artisans and musicians "Os Seivane": Alvaro and Xosé Manuel Seivane (father and uncle of Susana), Saínza and Irma Seivane (sister and cousin) and the prodigious multi-instrumentalist Brais Seivane (nephew of the bagpiper). With Brais, Yago Bouzada, the talented finalist of "Vai de Gaita" concours from TVG, and the hurdy-gurdy María López Carballo, Felipe Rey, finalist of Vai Gaita, Miguel Sanromán and Xaquín Bieito, winners of this game show, with the drummer Ruben Alcalde, they are rising stars of Galician music. And besides the virtuoso violinist Harry Price and the awarded accordionists Andrés Penabad and Pablo Bermúdez, great musicians who despite his youth have a long successful musical career. All of them and the Escola de Gaitas from Ortigueira and the Gaiteiros from Buxantes will make a final grand show together as an example of the connection between generations by traditional music. Presentation of the new album, FA! Susana Seivane at the AIDS Gala - Postponed! These are the new dates of Susana Seivane in Autumn: November 7th, Café Cultural Roi Xordo, Allariz - CANCELED November 21st, Sala Super 8, Ferrol December 5th, Sala Baranda, O Barco December 12th, Var con V, Moaña December 19th, Pazo da Cultura, Narón Tickets now on sale! See you there! After a short break for the birth of the second child of the bagpiper, Anton, new projects come this fall. The new season of the talent show Vai Gaita in Luar, starts on TVG, there you can see Susana Seivane as jury every Friday night from 22:00 pm. Also, there are new dates for the presentation of her new single and upcoming álbum. New dates coming soon! "Esperando a Fiz" now on sale! Be the first to hear the preview of the upcoming album of Galician famous bagpiper, in honour to her son Fiz, which reflects the emotions of pregnancy and the arrival of her firstborn Fiz. It is a romantic, evocative and inspiring disk, where the bagpiper shows her creative soul in a very special album, made for children and not so young people, parents and children of all ages. Now on sale on line! Available on iTunes , Spotify , Amazon, Google Play, Deezer ... Download it now! Now you can buy here the new DVD of Susana Seivane titled "Susana Seivane e amigos", revive the magic of this amazing concert, at Plaza de María Pita during the celebrations of the A Coruña city in August 2012 . The famous bagpipe in addition to her regular band , was accompanied by guests so important as Rodrigo Romaní (Milladoiro), Anxo Pintos (Berrogüetto), Anton Davila (Celtas Cortos), Xoel López, Harry Price, and a metal section formed by Pedro Lamas, Jose Rodríguez and Ricardo Formoso. With the special collaboration of the family saga Os Seivane: Alvaro and Xosé Manuel Seivane, Saínza and Irma Seivane and Brais Seivane, just 4 years old. 20 artists on stage, more than 2 hours of duration, high artistic quality, a Galician musical apotheosis! Presentation of the new album! On Monday April 6 , the master Susana Seivane will play at the Plaza del Parche ( Town Hall Square ) in Aviles , Asturias . It will be a 20:15 at the Fiestas del Bollo, and a local group will act before: Ajo 's Band . There the bagpiper will introduce his new single " Esperando a Fiz " and the new DVD " Susana Seivane e amigos", that will be soon available here . Do not miss the chance to see her live . See you there! Medical reasons forced to postpone the date of the most anticipated concerts in Galicia due to the uncomfortable symptoms of the early pregnancy of Susana Seivane, that prevent offer a full concert. Only the date of the concert at Club Clavicémbalo, is unchanged, February 28th. These are the new dates: March 7 - Sala Capitol, Santiago March 28 - Pub Gatos, Melide April 25 - Café Bar Cultural Roi Xordo, Allariz Tickets purchased will be valid for the new date. They may also be returned and recover the cost of entry. The gaiteira will come back in a few months with even more force to offer great concerts, the wait will be rewarded! See you in the new dates, we look forward to seeing you! Advancement of Susana Seivane next album! The renowned bagpiper Susana Seivane is near to release new album! These are the first appointments of the 2015. At first time, she will play songs from her upcoming album, specially designed to children, with the successes tracks of her discography. See this special advance, you can´t miss this opportunity. The first tickets are on sale. January, 10 - Sala Capitol, Santiago January, 17 - Pub Gatos, Melide February, 14 - Café Bar Cultural Roi Xordo, Allariz February, 28 - Club Clavicémbalo, Lugo We are publishing here the links to buy the tickets, stay with us, we are waiting for you! Yesterday afternoon in Ponteceso , O Couto ,one of the “Bos e Xenerosos” awards of the Eduardo Pondal Foundation went to Susana Seivane because of her work of promotion and dissemination of music, tradition and Galician culture, and because of her big sensitivity that she always demonstrates with the recovery, conservation , and transmission of Galician culture beyond our borders. Thank you very much! FOCUS GALICIA is a meeting that will be celebrated in Galicia, between the 19 and 21 october, before the WOMEX 2014 – The World Music Expo. WOMEX is the most important international market of the world. FOCUS GALICIA meets a selection of the most relevant 30 programmers, managers and agents of WOMEX to get knowledge about the musical reality in Galicia, through visits, forums, videos, etc. For this reason, on Monday, the 20th this group will go to the Obradoiro de Gaitas Seivane at 11:00, where is programmated a showcase of the most international bagpiper Susana Seivane. From 3rd to 5th October , at the Avenue Libertad (Vial Norte) in Córdoba, "Galicia Pórtico Universal - Córdoba " will be celebrated. 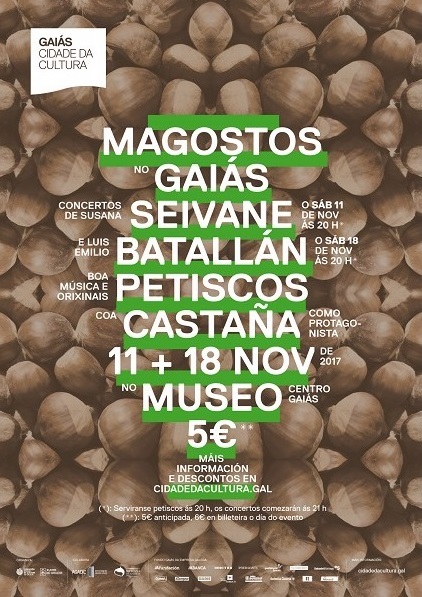 A Galician exhibition with crafts, an information area of the Jacobeo and Turgalicia , an aula of tasting , a poetry reading , and the performance of the Folkloric Group “Airiños da Terra” and Susana Seivane . The bagpiper will perform on Saturday, at 21:00, on the stage of the exhibition. This event is organized by the Xunta de Galicia and the Casa de Galicia in Córdoba. Don´t lose it! The talent show "Vai de Gaita" starts! On Saturday August 2nd, Susana will be in A Revista, a Galician TV program, where she will talk about heir new projects, you could see her about the 13h. The magic bagpiper will receive the Vieira de Honor to the Artistic Quality, a honor that the Enxebre Orde da Vieira will give her in Santiago, on 6 August at the Hotel Monumento San Francisco, this is a annual distinction to a Galician professional, that is notable especially in music, art and entertainment. On August 14th, at 24:00, the Susana Seivane´s speech will be the beginning of the festivities of Santa María de Cambre, the municipality of her residence, because of being a symbol of Galician culture and taking the name of Cambre worldwide. And on 23 August, Susana Seivane will perform at the XXXV Edition of Irmandiño Festival in Moeche. Her concert will be after the assault of the castle. It is for her an immense pleasure to return to this historic galician festival. Follow to Susana Seivane en route! Have a nice Galician Literature Day! Photo Luk Stiens The bagpiper Susana Seivane will celebrate next May 14th morning the Galician Literature Day with the children of CPI Ramón Piñeiro, from Pobra de San Xiao, in Láncara, Lugo. Susana is looking forward to have a nice chat with the children and share experiences with them! As most of you know, Susana Seivane presented on last Galician TV program Luar, the new and amazing single “Terra de Loitadores”! You could buy it very soon! Stay tuned! Susana Seivane will be on Saturday, April 12, in Narón, to inaugurate the solidarity gala against children´s cancer, at 19:30. All proceeds will be devoted to the investigation of this disease. This gala is organized by the Association Alba Perez. To buy the tickets, you can contact directly with the association or the Pazo de Cultura of Naron. There will be a row 0 for those who can´t attend and wish to give their support. And by night, the bagpiper Susana Seivane will have the honor of presenting one of the awards at the Mestre Mateo ceremony, at the Palexco auditorium in A Coruña. These awards of the Audiovisual Galician Academy recognize the best Galician audiovisual works. The Asociación da Gaita pays tribute on Saturday, April 5th, to the Seivane family at Festa da Gaita e Cantos de Taberna from Arzúa. All the Seivane family will attend this fest with the presence of the most famous bagpiper of the family, Susana Seivane. There will be activities all the day, parades, a meal, and more than 300 musicians participating in this festive celebration. See you there! Today, at 20:00, at Auditorium of Galicia, in Santiago de Compostela, the "Gala of the 80th anniversary of Galicia Radio Cadena Ser Serenity Awards" will be celebrated where the bagpiper Susana Seivane will play on stage. And on Saturday, 21th, at 20:30, the I Charity Gala against Cancer starts at the Municipal Auditorium of Ourense, where Susana Seivane will play with more artists. This initiative has been organized by the Asociación Cultural As Canellas and the producer Claqueta Coqueta, all the tickets collection will be for the Spanish Association Against Cancer. The tickets are 5 euros in advance at the headquarters of the Cancer Assotiation and 8 euros at the ticket office, in addition to the zero row for who that want to collaborate without attending the gala. Susana Seivane celebrates Christmas by supporting a good cause. This weekend the beautiful bagpiper will be on TVG, on Friday she participates as each week, on the program Luar as a member of the jury of the game show Vai de Gaita. And on Saturday night she will be in a very special surprise on the program Desexos Cumpridos of the TVG… See the television and reveal the surprise because now we can not tell you nothing! See and listen the muse of the Galician bagpipe! It will be on Sunday the 20th, at 19 pm, at the Pazo da Cultura, in Naron. This tribute is organized by the board of Culture from the City Council of Narón in collaboration with the Asociación de Gaiteiros Galegos, of which he is the president. Because of his 35 years working for our music and our culture. Entry is free prior collection of invitations. See you there! Susana Seivane on the Galician TV and Galician radio in autum! See and listen Susana Seivane! Every Friday night in the program Luar from the Galician TV, Susana Seivane will be part of the jury "Vai de Gaita" which begins today, the bagpiper faced this responsibility with great enthusiasm. Also, every Monday morning, Susana Seivane participates as a collaborator in a lively sports section of the program "Galicia por Diante" from the Galician radio. See and listen the lovely bagpiper, a really delight! The last summer concert of the bagpiper! The summer season of concerts of the muse of the Galician bagpipe ends as could not be better, in Galicia and sharing the stage with her friends Noitarega and Musical Moxenas. The night of the September 13th will be magical for the Galician folk music, at the Festa dos Dolores in Cabral, Vigo. A delight for lovers of traditional Galician music. And autumn begins with new exciting projects for the bagpiper that we will tell you very soon. On Saturday August 31 the beautiful bagpiper was at the set of the Galician TV, put the public up with her "pernas pra riba" and starred very funny moments. Susana's performance appears in the 48th minute. Concerts in August: Portugal, France, Belgium and Galicia! Susana Seivane does not stop! On Saturday, August 3rd, our bagpiper will travel to Portugal, to the Sendim Interceltic Festival, in the heart of the lands of Miranda, her performance is scheduled for 23:30. The next day she will back to Galicia, to the Pardiñas Festival in Guitiriz, that celebrates its XXXIV edition, she will act at 22:00. On the 15th the bagpiper travels to France to perform at the Festival Filet Bleus from Concarneau, the performance will be on August 16th at 21:00. And the 17th she will travel to Belgium, to the Deerlycke Folk Festival, in its XVI edition, there she will perform at 18:15. Follow her on road! You can not miss her! Next Thursday, June 20th, Susana Seivane will be at A Casa da Cultura in Meira, Lugo. 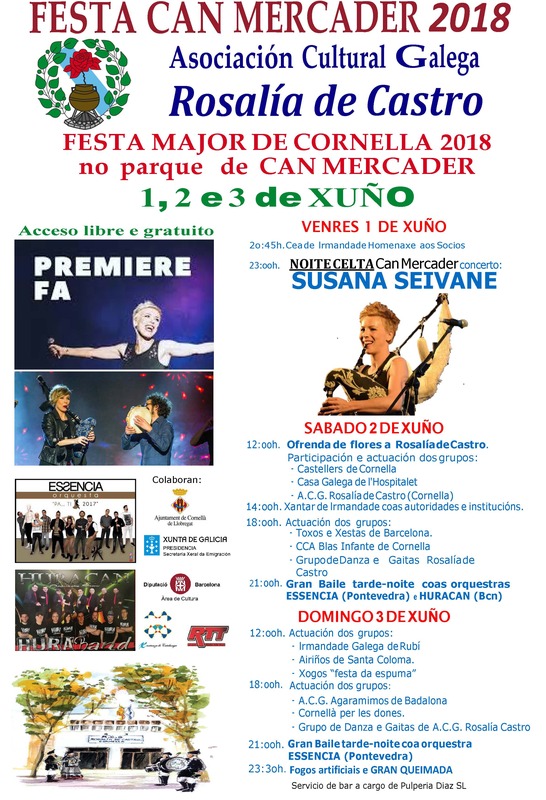 She is invited by the CEIP of Meira, there they will celebrate with the students the end of the class and the beginning of summer, which is full of fantastic concerts of Susana Seivane. In July, she will be back to France at the Great Festival Het Lindeboom from Calais, it will be on 18th. And on 27th, Susana Seivane will travel to Switzerland to perform at the International Folk Festival of Locarno. All is ready for the party! See you on the road! 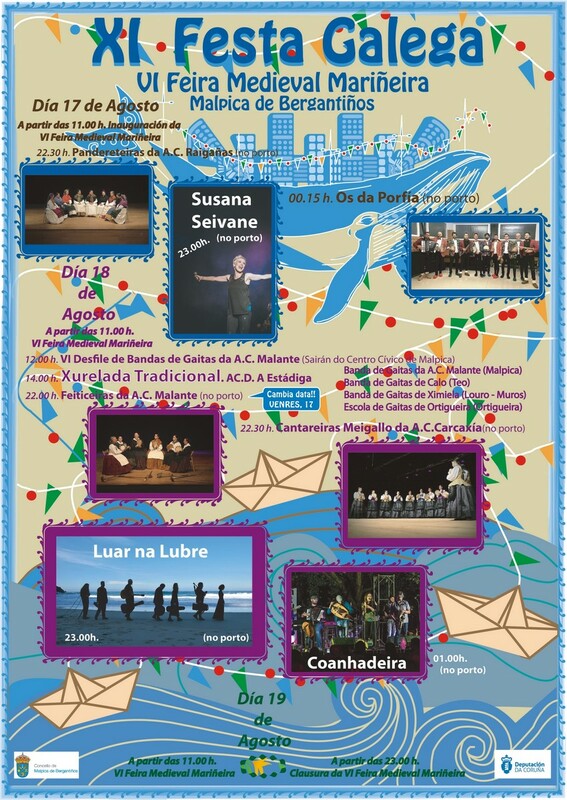 On May 16, Susana will be with the children from CEIP Ramon de la Sagra, in A Coruña, celebrating the Galician Literature Day, by talking with them and introducing them to the beautiful world of Galician traditional music and specifically our Galician bagpipe. Continuing this work, on May 25, in Italy, Bergamo, Susana will offer a great concert at Lo Spirito del Pianeta Festival, an international festival that runs until June 9 and that is dedicat_ened to tribal and indigenous groups of the Earth, a good approach to the cultures of the world. Susana Seivane will be soon in route! A year full of news! Susana Seivane is involved in the recording of her new album of lullabies. She is also preparing the tour to France, Portugal, Italy, Switzerland, and of course, Galicia and Spain. Coming soon the tour stops where you can follow her! In October Susana Seivane will be at the XXIV Bagpipers Meeting, organized by Airiños de Fene, that will focus on the celebration of the 25th anniversary of the band and which this year will honor Miguel Doval and Chus Niebla. There will be many friends accompanying them on Saturday the 6th, at 19:30 at the SCRD Agarimo of Sillobre, Fene. Next Saturday, Susana will attend the tribute to Fito Domínguez, singer and founder of A Roda, who died last September, will be held on October 13th at the new auditorium Mar de Vigo. Numerous colleagues, among them Susana Seivane, will offer this heartfelt tribute to the illustrious musician. That weekend you can see her with very good company at the program of the Galician television, called Luar. Next September 28, on Saturday, at 21:00 in La Coruña, it will be one of the main activities of the project "Coruña without Borders", conducted by the NGO Doctors without Borders. This meeting of solidarity will join numerous guests: writers, actors, comedians and musicians among them Susana Seivane. The goal is to show the work of solidarity of this organization and collect funds to continue with it. See you there! 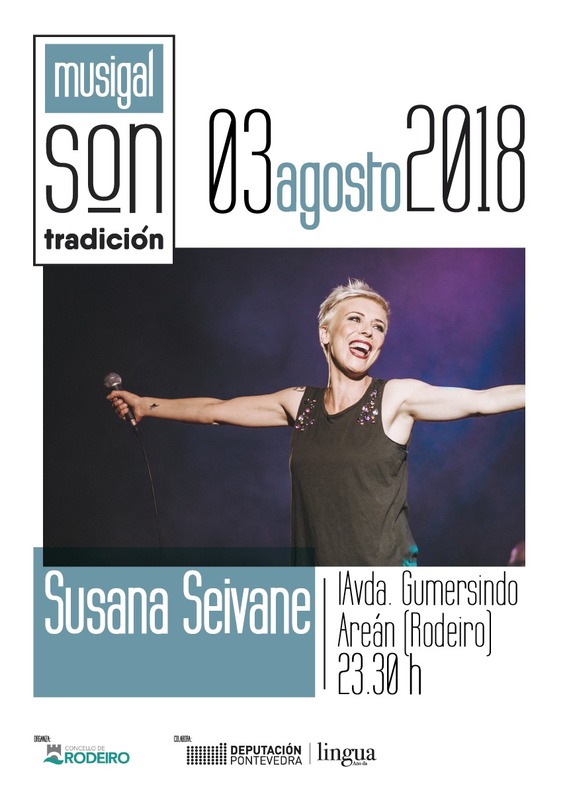 Susana Seivane at Ribadeo, Zamora, A Coruña, Baiona and Gondomar! Full of concerts in August! Upcoming events of the enchantress gaiteira start in August at Ribadeo, where Susana will have the honor to attend the 50th anniversary of the Asociación de Amigos da Gaita Galega. It will be in August 4 from 20:00 on the day of the Bagpipe and Pilgrimage to Santa Cruz. Susana will make the opening speech of the party and its magic will be at night more present than ever ... Two days later, in August 6, at 22:30, will be at Lubián, Zamora. The following concert is at Maria Pita, where her big show "Susana Seivane more friends" will catch the heart of the city of A Coruña on Wednesday, the 8th of August, from 22:00 pm. The next day, the 9th at 23:00, will be in the beautiful town of Baiona, and the day 11th in Gondomar, at the Plaza de la Alameda, inside the “Rede Galega” of Theatres and Auditoriums from Agadic, with her new show "Essences" from 23:30. Go with her and you will be prisoner of her charm! Concerts in Belgium, France and Galicia! Susana Seivane summer tour begins! The summer tour of the beloved gaiteira starts in Belgium, on July 8th, at the great Gooikoorts Festival. As usually, she will be in France where always is wellcome. She will play at the prestigious Château d'Ars Festival on July 13th, at the 35th edition of the Rencontres Internationales de Luthiers and Maîtres Sonneurs, in Saint Chartier. And two days later, she will be at the fantastic Festival Kann Al Loar from Landerneau, that will be on July 15th. 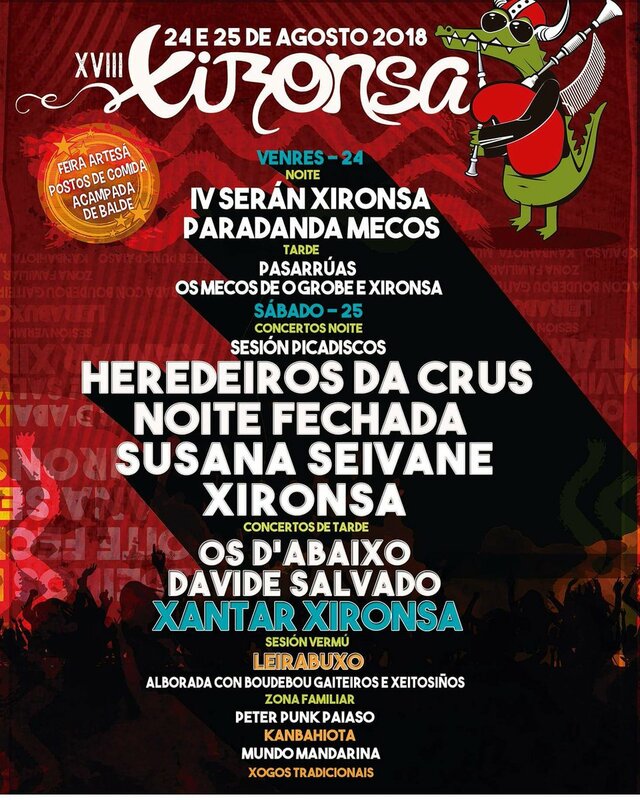 In July, Susana´s concerts continue by Galicia, on day 24th she will be once again at the Festa da Fraga in As Pontes. Susana Seivane is en route, enjoy her music! On Friday, April 20, Susana Seivane has the honor of being one of the artists invited by Suso Vaamonde, Pedro Lamas and Xosé Lois Romero. A trio described as the most sarcastic one of Galician music. There will be many more friends! At the Teatro Rosalía in A Coruña, at 20:30. Also at this theater in A Coruña, on May 16, Susana Seivane and Rodrigo Romaní will play together at the XI Premios Opinión, the gala will begin at 20:30 and they will open this event full of surprises. Follow Susana Seivane en route! Live the carnival with Susana Seivane! Susana Seivane will be at O Burgo next Sunday February 19th. The concert will be at the beautiful seafront from O Burgo, at 21h o'clock in the night. Her performance is part of the program organized around the I Edition of the Festa do Cocido at O Burgo in this carnival weekend. At this nice setting, you will enjoy this gastronomic feast, the disguise parade, the orchestras, competitions and of course our magical bagpiper. Enjoy yourself! The Xunta de Galicia celebrates an official act in honor of Mr. Isaac Diaz Pardo, at the Bilblioteca of the Cidade da Cultura, in Santiago, on February 8th, at 18pm. The gaiteira Susana Seivane after attending in January last events of his official farewell in Santiago and the emotional tribute organized by the Sada City Council, she pays tribute to Mr. Díaz Pardo again. Susana Seivane will attend this act organized by the Xunta at this emblematic building, in which Susana Seivane will dedicat_en_ene some pieces to the memory of this dear Galician intellectual. Susana Seivane arrives on Thursday to the Tourilandia Republic television. You can see her in this humor land, from 22h. The gaiteira Susana Seivane will surprise you at this new program, released two weeks ago on Galician Television. Have fun! Susana Seivane will attend the tribute prepared by the City of Sada to the intellectual Isaac Diaz Pardo, who died las January 5th. The gaiteira, after having had the privilege to accompany him with the gaita at the official farewell in Santiago, with her presence in Sada, once again shows the affection of Seivane family to the figure of this unique Galician artist. The event will be next Friday 20, at the auditorium of the Casa da Cultura, Sada. Today Galiciademoda magazine celebrates an awards ceremony and Susana Seivane will be awarded because of promoting Galician fashion through her music. The act will be at 21:00, in A Coruña, where the bagpiper will receive this recognition with emotion, at Culleredo Style Outlets. 25 anniversary of the Hogar Sor Eusebia Foundation. Susana Seivane finishes this year by supporting the good causes. Susana Seivane will be next Saturday, November 26, next to the needy by celebrating the 25 anniversary of the Hogar Sor Eusebia Foundation, from A Corunna, where at the moment live 55 homeless. This initiative is supported, among others personalities, by our bagpiper who will attend the events prepared by this charity association for that day, that will start at 19:00 pm. In this way, the artist welcomes Christmas. The magician of the gaita Susana Seivane will be on Thursday, November 10 in Narón, by offering an unforgettable concert, the appointment will be at 20:30 at the Pazo da Cultura. The spell of the bagpiper will captivate the audience in a near and exciting show, that you can not lose, see you there! After a summer full of success, Susana Seivane wellcomes the autumn with a concert on October 15, in As Pontes de García Rodríguez. The show will be at the Municipal Auditorium Alovi, at 21:00h, 3 euros/each ticket. You can not loose it! Also this autumn, the sounds of the bagpipe of Susana Seivane will arrive to the auditorium of Narón, on November 10. Enjoy an unique mode of playing the bagpipe and understanding Galician music! Susana Seivane Summer Tour continues! The most dazzling blue eyes of the gaita will arrive at Sanxenxo next Thursday. 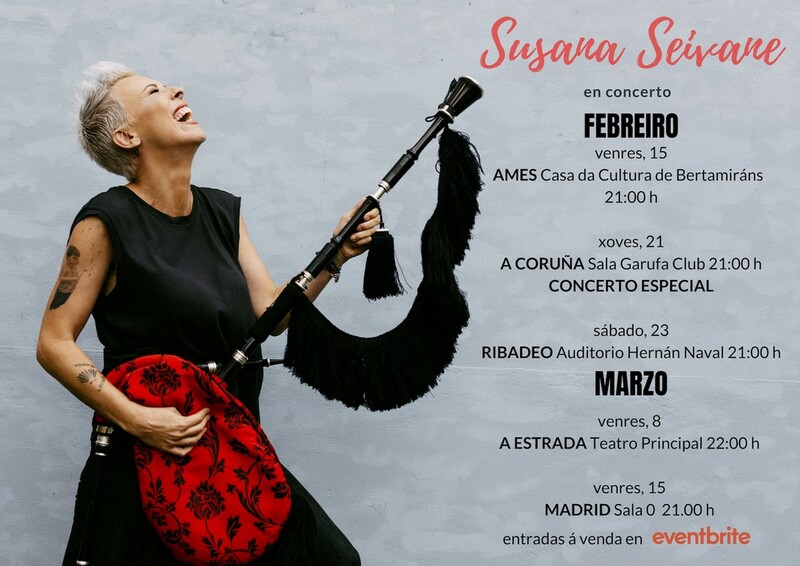 Susana Seivane continues her tour in Galicia. This seducer of the galician folk music will be at the celebrations of this this beautiful town of Pontevedra, next Thursday, on August 25, at the Plaza del Mar, at 23:30. 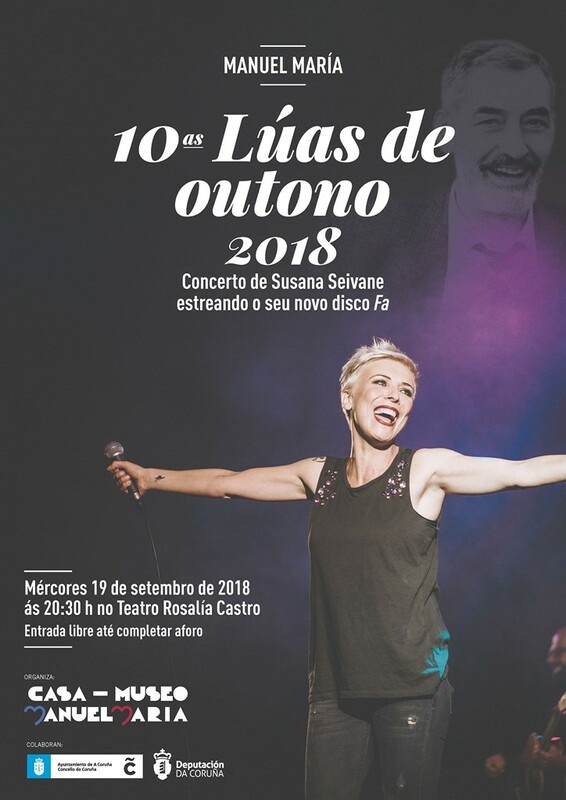 The great show of Susana Seivane, one of the brightest stars of the Galician musical firmament, will be the highlight of the celebrations of this town. Enjoy the show! After the success of her tour in France, the international gaita of Susana Seivane will sound at the IX Edition of the Noite Folk in Negreira. Folk music lovers will enjoy the melodies of her last album Os soños que volven and the sounds that have accompanied in her life. It will be on Saturday 20, at the beautiful natural surroundings of the Refugio de Pescadores from Covas, at 23:30. The acclaimed bagpiper will be the great attraction of this young folk music festival. Get ready to the party! Susana Seivane again in France! The muse of the gaita will be in France this week. As in previous years, the appointment with the neighboring country cannot miss the summer tour of the gaiteira. She will be there on August 11, Thursday, in Brest, participating in Les Jeudis, a month full of activities and outdoor concerts at this beautiful French ville du Finistèrre, the concert will be at the Port de Commerce, at 21:00. And next day, it will be Paimpol that enjoys the magic of the gaiteira, on Friday August 12, at 24:30, at the Festival du Chant Marin et des Musiques des Mers du Monde. ¡An unique opportunity to enjoy her music in France, that so much love her! Susana Seivane in Ribeira and A Cañiza! Susana Seivane Tour continues in August! August is full of concerts of our beautiful bagpiper. The first place where you can enjoy her show will be in Ribeira, on Friday 5, at the Plaza de España, at 24:00. The same weekend, the bagpiper and her band will play at the town from Pontevedra, called A Cañiza, on Sunday 7, at the Plaza Mayor, at 22:30h. Enjoy Galicia in celebrations with her exciting show! Concert in Carballo, July 22. After passing through the celebrations of Carmen from Barakaldo, the muse of bagpipe returns to Galicia. This time will be Carballo who vibrates with the dynamic, original and fresh show that keeps the audience fun from the opening stages till the last encore. Enjoy the permormance of Susana Seivane and her talented musicians on Friday, 22 July, at 22:30 at the town square! You can not lose it! Karmenak 2011 welcomes the gaiteira Susana Seivane tomorrow Tuesday 12 of July, she will be at 21:30 at the Parque de los Hermanos. This concert is included in the extensive program of celebrations of Barakaldo and it takes part of the XXIII Edition of the Festival of Pop Music called “Munduko Hiriak”. Follow Susana Seivane and her band in route and enjoy her music! After the success of Susana Seivane at the Briganfolk in Betanzos, the Festa da Cultura from Vigo will welcome the magical gaiteira and her amazing show this weekend. Susana Seivane´s concert will be on Sunday 3, at 22:00 at the Puerta del Sol, as the end of many activities that are organized in the city center during these days, such as performances of bands of bagpipes, tradicional Galician dancing, etc.. and where there will be stands dedicat_en_en_en_en_ened to the typical food, the regional dress, folk games, etc.. There will be two days of cultural celebration where it will be impossible to get bored. This is the first concert of the Susana Seivane summer tour, that will take her across Galicia. Carballo, Ribeira, A Cañiza, As Pontes and Negreira are some towns that will vibrate with her spectacle. 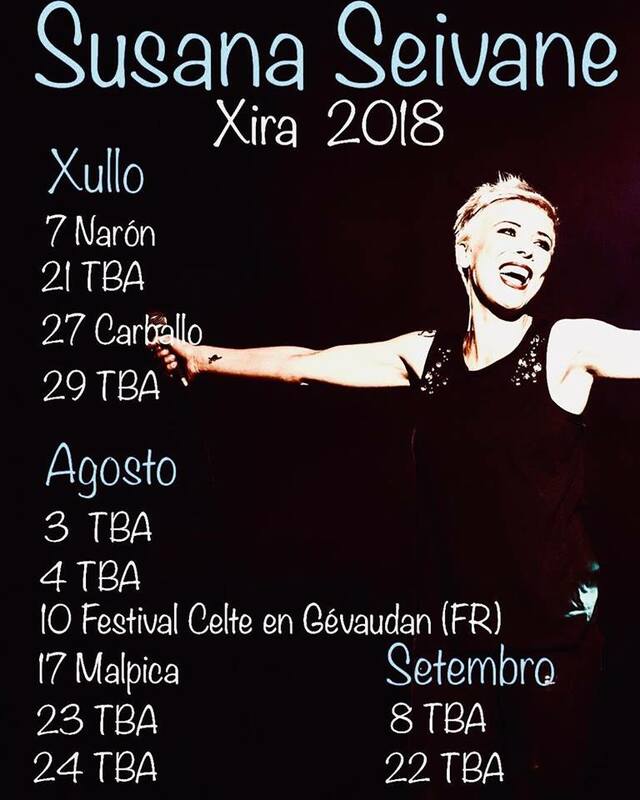 The second tour stop will be Barakaldo, ten days after Vigo, and she will return to Galicia to continue the tour until, as usual, she returns to France, where she will be in two of the most important festivals, the Festival du Port Jeudis in Brest and the Festival du Chant Marin in Paimpol. Susana Seivane doesn´t stop, follow her in route! Today watch Luar, of the TVG, to see Susana Seivane playing with some of her musicians, it will be a small good advance of her exciting tour. You can see her from all over the world, you can not lose it! June can not start better, Susana Seivane will be in concert at the international Celtic festival Briganfolk. It will be in Betanzos next Sunday 12 June. 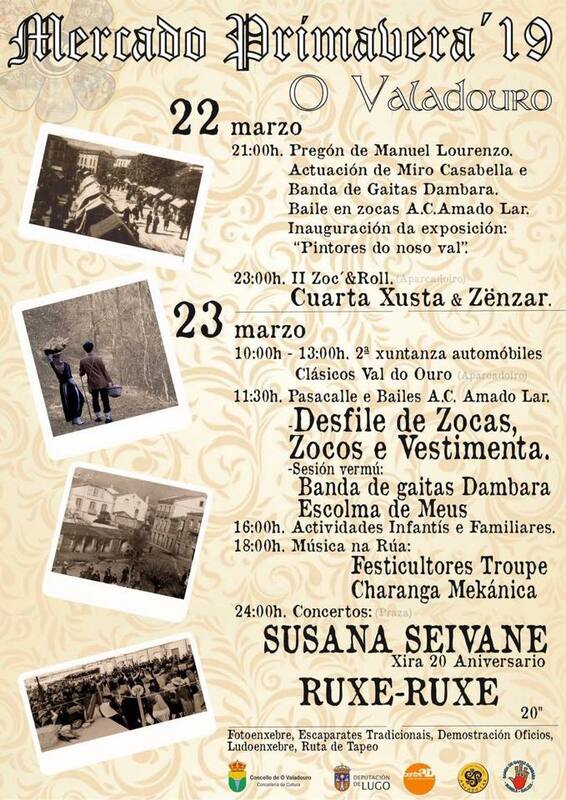 Come to this beautiful town and enjoy once again the great spectacle of Susana Seivane and her band. See you there! Burgos is looking forward the first concert of the season of Susana Seivane in Miranda del Ebro, on friday May 6, at the Cultural Caja Burgos at 20:30. And the next day will be Aranda del Duero, which vibrates from the first chords to last note with the music of our artist, will be at the Cultural Caja Burgos, also at the same time. The ticket price is 10 Euros, (see the discounts) Follow her in route! Saturday April 9 at the Vigo Municipal Auditorium from 21:00 pm, Susana Seivane will act as special guest with the traditional band Noitarega. Without any doubt, a must for lovers of traditional Galician music. Tickets, priced at only 5 euros, are available in advance on the website: http://www.laboleteria.es See you there! Concert on March 13, at 20:00. After the success of her African adventure, Susana Seivane will attend one of the most important gastronomic event in Galicia, the Festa do Queixo from Arzúa, which celebrates its 36th edition on March from 11 to 13. Susana Seivane will act on Sunday, 13 of March at the Campo da Feira, at 19:30, Susana´s amazing performance and her magical playing will be the perfect finale to the festival. We expect you there! On February 15th the Susana Seivane tour begins by the most important cities of Morocco. Marrakech, Rabat, Casablanca, Tetouan and Fez will surrender to the charm of Susana Seivane´s gaita. For a few days the enchantment of the gaiteira will be merged with the exotic Moroccan culture to offer an unforgettable spectacle... Enjoy this unique opportunity to see our gaiteira in the African continent! Susana Seivane next to initiatives for a better world! Susana Seivane celebrates Christmas by supporting good causes! Friday November 3 at 12:00, Susana Seivane will play at the opening ceremony of the World Education Forum for Peace, which will be developed at the auditorium of the USC. Forum 2010 is a great container of worldwide events and activities that is about the Culture of Peace, and it weill be celebrated in Santiago de Compostela, from 3 to 30 December. On Friday 10 December at 20:00, Susana Seivane will be in the benefit Gala "Tierra de Hombres" at the auditorium of Caixa Galicia Foundation in the Canton Grande in A Coruña. This foundation promotes the development of childhood, defending their rights without any political, racial, religious or gender discrimination. And Thursday, December 16 at the Teatro Rosalía de Castro in A Coruña, at 20:30 Susana Seivane will play in the benefit concert organized by the Institution of Padre Rubinos in favor of people without resources. Like Susana, all of us must support these initiatives! Concert with Los Limones at Playa Club in A Coruña, November 19, at 24:00. Today, November 18, Susana Seivane will plant the first tree for Parkinson in the province of Pontevedra. The Spanish Federation of Parkinson and Parkinson Association in Galicia- Bueu, in collaboration with the Programme of United Nations for Environment, will open the action of planting a tree for Parkinson. This initiative tries to promote social integration of those who living with the disease. The program will be repeated in thirty-three points of Spain in order to give more visibility to this disease. And tomorrow, November 19, Susana Seivane will play with her friends the Limones at the Playa Club in A Coruña, at 24.00, it will be a great party that you can not lose! Next Friday, 22 October at Teatro Arbolé in Zaragoza, Susana Seivane´s fall tour starts and it will take her on Thursday, 4 November, to the Sala Clamores in Madrid and Saturday 6 November to the Sala La Vaca in Ponferrada. Follow Susana Seivane in concert and enjoy her gaita and voice live! Presentation of project "Quero Ser"
ASPANAS, Association of parents for people with intellectual incapacity, will present next October 14, the "Quero Ser” proyect, a collection of handmade accessories from recycled materials by people with intellectual disabilities. The presentation will be at the Auditorio Municipal de Ourense, at 20:00, Susana Seivane, and other artists, will participate in the act, by giving her support to this initiative. You can pick up your invitation at the Municipal Auditorium of Ourense, at ASPANAS, at the Information Point of Outariz or at Cadena 100. See you there! 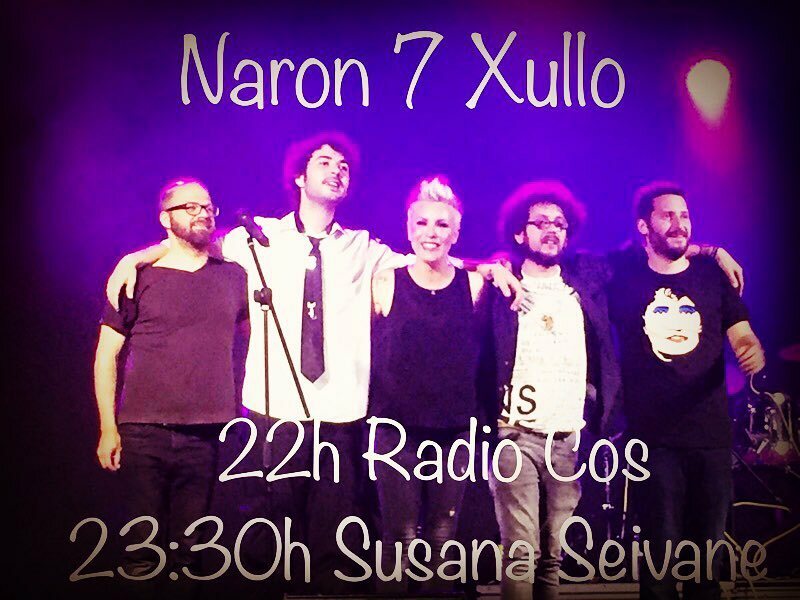 After canceling the concert of Buika that had been predicted today in Lugo, on the occasion of the celebrations of San Froilán, Susana and her band will play at Santa Maria Square, starting at 20:30. See you there! Susana Seivane opens the autumn concerts! This friday October 1, she will be the guest artist of her old friends Los Limones, Susana Seivane collaborated with them many times. The concert will be at 21:30, at the Sala Galileo Galilei, in Madrid. Don´t lose it! Susana Seivane participated last Friday in Riotorto, Lugo, in a tribute to the musicians and researchers Mini and Mero, today one of the benchmarks of galician artists. Mini and Mero are considered one of the pillars of the present folk Galician music. Susana Seivane with her presence and music, recognized their career and the work of these pioneers in defense of Galician culture and identity. Susana Seivane participates with a large group of Galician and Spanish musicians in a album tribute to the Beatles, entitled 50. With more than 50 versions, and the collaboration of Yoko Ono and the sister of John Lennon, Julia Baird, who recites some texts. This project was developed at the beginning of the last year, initiative of Médicos sin Fronteras, by Chema Ríos from A Coruña, that tries to collect money for this organization in the 40th anniversary of the Beatles' separation. The album will be released next Christmas in a triple format. Hope you like! Our most beloved gaiteira, was last friday, September 10, at the program Tantarantán, of the TVG, playing some of the songs from her latest album "Os soños que volven" melodies of her childhood and memories that always accompany her, as do “Foliada do Quinteiro"or "Qué dirán” Look for the program by clicking on the link below! The program Ben Falado emitted on September 1st, an interview where Susana Seivane speaks of her identity as Galician, the language, the music as an universal lenguage, the pride of belonging to a people and land with its own culture, of that she is so grateful and satisfied that she takes all over the world. Look for the program Ben Falado on the link and listen how our gaiteira speaks with so much respect and feeling about her roots. The show “Susana Seivane and friends” was presented for the first time in 2009 at Ortigueira Celtic Festival and it has been getting triumphs in each of its presentations. In the last two appointments, “Susana Seivane and friends” has been a resounding success, in A Corunna, in the celebrations of Maria Pita, and Pontevedra, in the Festas da Peregrina. “Susana Seivane and friends” is a vibrant, very intense and dynamic show, with more than two hours of duration, with prestigious guest artists as Rodrigo Romaní, Anxo Pinto, Xosé Manuel Budiño, David Paz, Jose Rodriguez and Jose Somoza. This show has made to vibrate, exciter and dance to the Galician public. The mastery of Susana with the gaita and her warm voice has made to enjoy the audience like never, by lefting an exciting memory and desires of more into the public of both cities. Follow the 2010 vibrating tour! Next day 6th of August, Susana Seivane and her band will come back to the neighboring country. 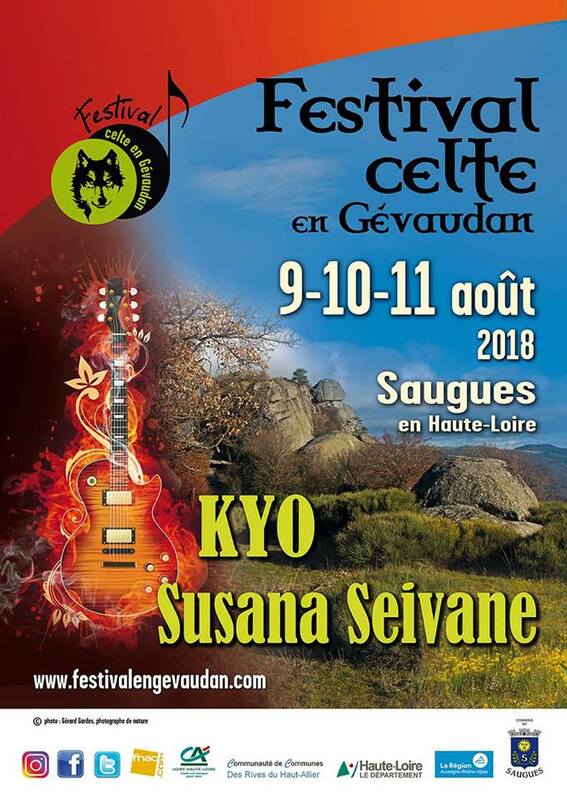 The appointment will be at the prestigious Festival of Gévaudan, in Sauges, where Susana and her musicians will play at 21:00. Just finished the concert, they will go back to A Coruña for preparing the great show “Susana Seivane and friends”, with amazing collaborations: Rodrigo Romaní, Anxo Pintos, Xosé Manuel Budiño and David Paz, Jose Rodríguez and Jose Somoza, it will be engraved in the Coruña´s mind for a long time. 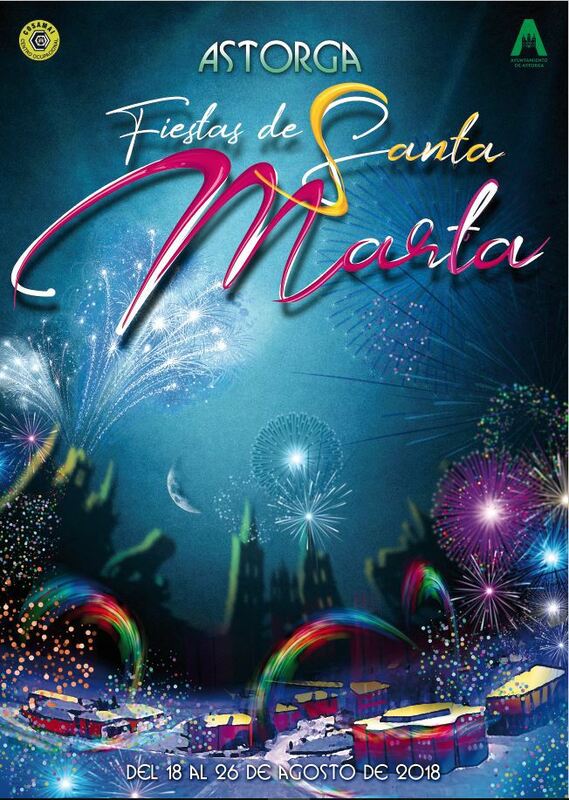 The concert is part of the celebrations´ program of Maria Pita, it will be on 13th, at Maria Pita square at 22:30. And only, two days later back to the road, this time to Pontevedra, at Festas da Peregrina, where Susana will play on 15th, again with exciting collaborations. Follow her in route! Susana Seivane´s Tour doesn´t stop! After the great Ortigueira Festival where Susana played with the Celtas Cortos and the Oysterband. In the month of July she will be in France, acting with the Bagad Kemper on 17, in the 35th edition of "Rencontres Internationales de Luthiers et Maîtres Sonneurs" in Saint Chartier. In Galicia she will celebrate the Santiago Apostle next saturday 24, at the Gala of TVG, with very special collaborations and on sunday 25, concert at Festigal, at 22:00, South Campus of Santiago de Compostela. She will continue her route by the Spanish festivals until Avilés, where she will act as a great finale at Beltaine the 31 July. And Susana Seivane´s concerts go on… enjoy them! Concert with Celtas Cortos and Oysterband. Susana Seivane never enjoyed like this thursday 8 at the Festival Internacional do Mundo Celta de Ortigueira 2010, where she took the stage to be the guest artist of great Oysterband and Celtas Cortos. Susana played for the first time with the masters of Oysterband and again with her friends the fantastic Celtas Cortos. A devoted audience again made to this festival the most beautiful in the world, as she always says. 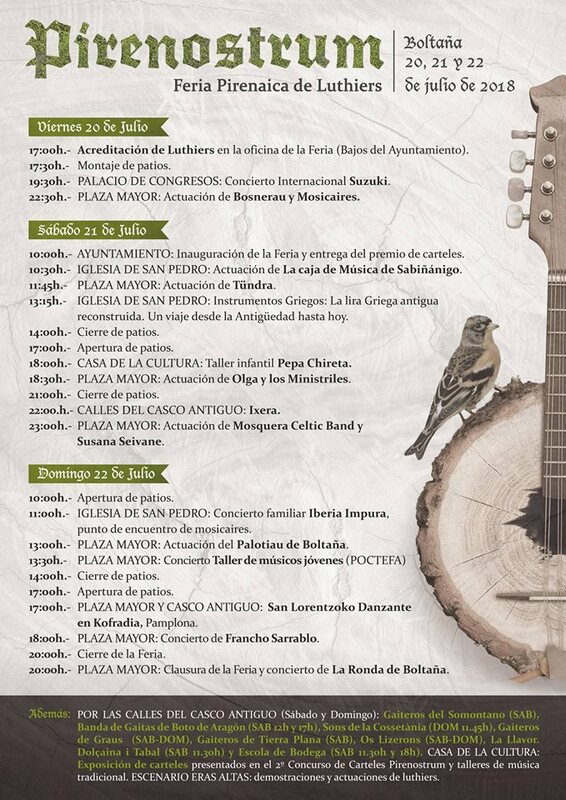 The virtuous gaiteira continues touring the festivals in Galicia, in June she has two appointments with her loved public from Pontevedra. The first one will be the next Sunday the 13 at 19:00 in Silleda, closing the big program of the 33 Feira Internacional de Galicia, in the Semana Verde-Salimat. And in the second one Susana will be the highlight of the celebrations´program in A Estrada on Saturday the 26. 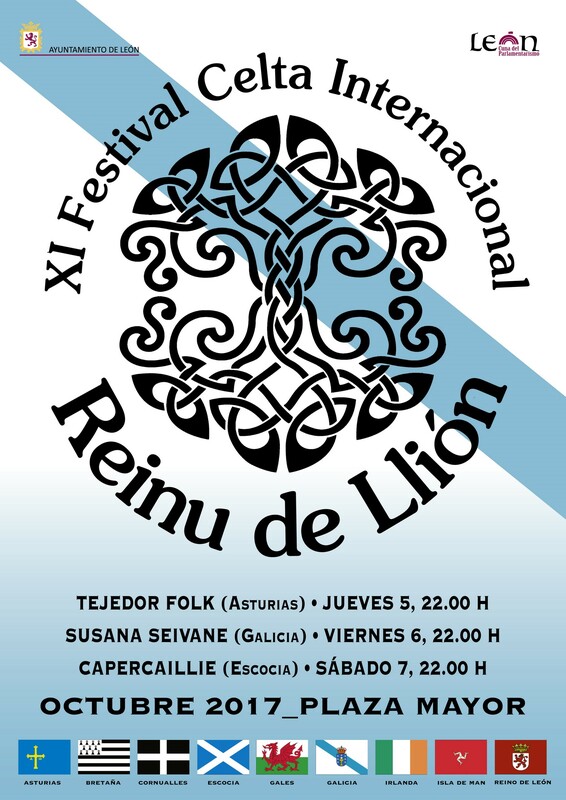 This month she will travel to the IV Festival Internacional Celta Reinu de Llión, where she will delight to the audience, with a fantastic concert at the square Don Gutierre on Saturday 19 June, at 22:00. Go on tour with Susana and enjoy her exciting live! Xacobeo Raíces 2010 is a creative project that has been crossing Galicia from March to June, through concerts offered by the Galician artists who collaborate in it. And it launches to the the market in this Holy year the publication of an official CD-book about the Way of Saint James, titled Cantigas do Camiño that includes new songs that show a full vision of energy about the music of the Way of Saint James. Ours most beloved gaiteira, opens this album with “Camiño Longo”, a personal and contemporary, inheriting of centuries of musical tradition proposal. Live the Way of Saint James by listening this beautiful music! Susana Seivane celebrates this way the day of the Galician letters, doing what better she knows. Thus she will act in Ponteceso, at O Couto, on Sunday, the 23rd of May, at 19:00, in front of the Eduardo Pondal Foundation, putting the finishing touch to these Galician days of the Festiletras. The Festiletras is celebrated in Ponteceso from the 15th to the 23rd of May, with a rich cultural program of celebrations. You are all invited! Today, May 6, at 23:00, Susana Seivane will be the protagonist of the Alalá program of TVG. Alalá will emit fragments of Susana´s musical performances with documentary parts on her everyday life. The program tries to reflect her way of thinking, feeling and perceiving music and world, being testimony of the most personal facet of the artist. Share a day in her life and discover her. know a little more about our most universal gaiteira! 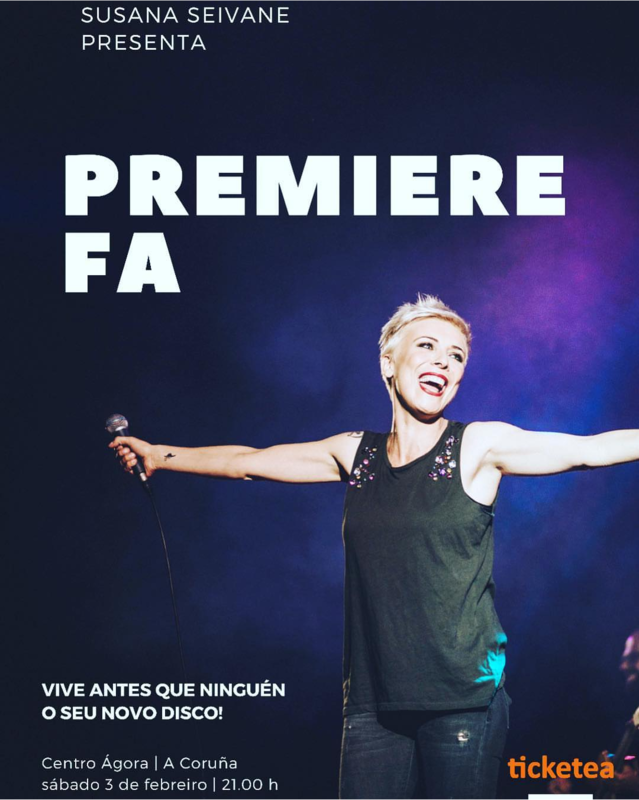 Susana Seivane will act at the Auditorio Municipal Gustavo Freire in Lugo next April 24, at 22:00, preceded by the Quempallou band performance at 21:00. The tickets are already on sale in the Caixanova´s web ticket office. You can buy them by following the link you will find below. This concert is part of the program Xacobeo Raíces, a cycle of concerts in Galician cities and towns, with a special concert in Madrid, and a total of 25 artists and Galician groups. See you there! Susana Seivane will launch her new CD ‘Os soños que volven’ at Centro Cultural Caixanova Teatro in Vigo next April, 9 at 20:30. The tickets are already on sale in the Caixanova´s web ticket office. You can buy them by following the link you will find below. The price includes one unit of the CD ‘Os soños que volven’ that will be given at the entrance of the spectacle. We hope to see you there!!! Susana Seivane closes the year of Galicia in Lorient. More than 7000 people met in the Port de Pêche to listen to the concert that Susana Seivane offered on August 8th in Lorient. The public enjoyed the themes of her new CD ´Os soños que volven´ that was greatly welcomed and had a great impact in Breton mass media. On August 9th, Susana Seivane closed the Festival in the Pavilion of Galicia that was completely packed. This performance ended 10 days of concerts that Turgalicia programmed to commemorate the year of Galicia in Lorient. Susana Seivane presents her fourth album. Susana Seivane’s fourth album will be presented on June. Following 'Susana Seivane', 'Alma de buxo' and 'Mares de Tempo', the new CD which will be entitled 'Os soños que volven’, is conceived as a tribute to Galician traditional music. This new contribution from Susana is full of catchy melodies and surprising chords. Her passion for tradition, long experience of more than 10 years on the stages around the world, and her own artistic restlessness, lead now Susana to recreate those themes that she used to play in her childhood. Old sounds recovered from an original perspective that is the result of her strong live performances in recent years. These suggestively simple tunes are drawn, in the purest way, by Susana’s bagpipes and voice on a canvas coated with harmonies, rhythms and contemporary and daring musical ideas. A new colour comes out from this mix demonstrating that traditional music is alive, and perfectly matches the trends, and the most advanced musical arrangements. Susana Seivane awarded with the prize Xarmenta of the Galician language. Xarmenta, the Galician Language Association from El Bierzo has granted, in this fourth edition, the Xarmenta prize to Susana Seivane in deference to her work defending and speaking the Galician language. Susana appreciates and shares this distinction with all women, especially with those from El Bierzo, who have been the principal architects of Galician transmission to their children. The award will be presented during a performance to be held at the Bergidum Theatre in Ponferrada on the upcoming Jan. 15. It will also perform the folk group Aira da Pedra which shares the same prize in the category of institution, with the Villafranca Pipe Band. Susana and Aira da Pedra will perform in the festival in company of the magician Richard and Anxo Rei. Your old photographs on the new album of Susana Seivane. During next January, Susana Seivane will begin recording her fourth album. 'Os soños que volven' , that is it’s title, is born as a tribute to the ‘songs of a lifetime' that Susana used to play in her childhood, and that she now re-creates dressed up with contemporary and daring musical arrangements. If you want to participate with Susana in the design of the covers, you can send your old photographs to be printed on the front and on the back. They can be of any subject, black and white or colour, but must be taken before the 80s. You can send them scanned at 300 dpi to info@susanaseivane.com until end of December. We appreciate your help! The main event will be the discovery of a bust and a retrospective exhibition on Xosé Seivane. A tribute to Xosé Manuel Seivane Rivas. The association Recunchos de Ribeira de Piquín organizes on Saturday August 8, 2008, a party-tribute to Jose Manuel Rivas Seivane in O Chao de Pousadoiro, place where he had settled his workshop for over 50 years. The events begin at 10:30 am and will happen throughout the day to finish with a concert by Susana Seivane, fireworks and a dancing party. The tickets for the lunch and dinner must be withdrawn on phones 653 720 232 or 616 474 942. The opening address will be read by Susana Seivane. The Seivane family wishes to thank publicly this deference to the association Recunchos de Ribeira de Piquín and all persons and entities collaborating in the event. She begins her European tour. Susana Seivane has just begun her 2008 European tour. Les Nuits Celt'Istres of Istres, France and the Trad-it Festival in the Netherlands, were her first journeys in which she met a great success. Near soon she will be back in France for the Festival des Cultures de Montagne which wallpaper you can see in the photograph. Europe is still in love with Susana. It follows the fantastic tour 2007! Susana Seivane again in South America! Next day 6 of August, Susana Seivane and her band will return to cross the pool. The appointment will be in the mythical Theater Avenida of Buenos Aires, where Susana and her musicians already acted in the 2003. The reason for the concert is the visit of the Vice-president of the government María Teresa Fernandez de la Vega to the country. Nothing else to finish the concert, they will go to the airport to embark in the last flight in the night from return to home, since day 10 of August the appointment is in the Seat of Galicia de Boiro, concert framed in the program "Vai de Camiño" that organizes the Xacobeo. After this concert, on the following day in the morning they will take another airplane, this time for Crozon (France), where Susana Seivane and the Bagad of Kemper will make their spectacle Sud ar Su in the Festival du Bout du Monde. To the following day, 12 of August, she will return to the Festival de la Danse Bretone et de la Saint Loup, in Guingamp (France) where she and her band had excellent critic, which caused that only two years later she is required again in this festival. We followed in route! In the heat of tour 2007 already we can offer images of our Susana in the Festival "Cantabria Infinita"l and the celebrated Pro-European Day in the Palace of Trasalba, Ourense. We continued of tour in Madrid, Arzúa, Carral and Santiago. It continues the tour of Susana Seivane! The next appointment will be the 19 of July in Madrid, in the Casa Galicia, celebrating the day of Galicia in Madrid. The day 20 we see ourselves in Arzúa where she will share night with the Group of Folk music "Ruote", in a spectacle framed in the program of the Xacobeo "Vai de Camiño". The tour will continue the day 21 in the bar "Sala the Star" in Carral, where we will have the opportunity to see a Susana Seivane with a familiar and much more intimist spectacle of which she has to us customary. You cannot lose it! And to the appointment that, without a doubt, you must attend is the one that will take place the 25 of July, will be in the Seat of the Quintana, in Santiago de Compostela, within the Program of the Celebrations that the City council organizes. We will have the occasion to see one of the fulfilled dreams of Susana, since by reasons for work of previous years, this one will be the first time that the charmer and magician seat receives the spectacle of this artist who is harvesting excellent critics in her tour 2007 throughout all the countries and festivals that has visited in this year. And we finalized the month of July in the mythical Festival Castle of L'Aínsa, Huesca, where 8 years later Susana Seivane will return to visit this beautiful scene. We see ourselves in route! Susana Seivane crosses the pool again! Already lack less! In only hours, Susana Seivane will be arranged to continue her tour 2007 once again crossing the pool. Beginning tour with great praises of press and public in the Festival Celta de Vícar (Almeria), followed of the Internotes Festival, in Cébazat (France) and for days in the Festival Les Irlandays in Juvisy sur Orge (France), this time she will respectively visit with her spectacle the cities of Montevideo and Buenos Aires days 24 and 25 of March. The concerts are framed in the cycle "Música Galega no Río da Prata", organized by the General Secretariat of Emigration of the government of Galicia. For more information on the places, invitations, schedules, etc. : secretaria@xeitonovo.org.ar If you can go, you do not lose this great event, will be many surprises!